For the last 3 years, or slightly less, Dimitar Berbatov has perhaps been that one player to have shouldered the disappointment of not one but several United fans (read millions and still counting). But the disappointment which bothered him the most, and still does, is the one of himself. The big Bulgarian’s impending move to Manchester United was followed with great curiosity across the footballing world. Sir Alex openly admitted interest in him, breach of code they said. Tottenham were determined to milk it and sure they did when Berbatov moved to MUFC rejecting City in the process who also had their bid accepted. The fee was supposedly something around 30.5 million pounds and here I am writing this. The new no.9 started off his United career with an assist against Liverpool. Mesmerizing ball control, turning around the defender and sliding a neat pass for Tevez. Sign of things to come? The match ended in 2-1,and yes United lost. First league defeat of the season and first to Liverpool since 2002 in the league coincided with his debut. The next game could not have come at a better time for Berba, Chelsea away and maybe time to mark his arrival. In retrospect, had his shot gone in that day the story could have been far different. Ji Sung tapped in of the rebound from Berba’s shot which was parried by Cech. Still waiting. His first goal came against Aalborg in a Champions League group fixture. The jinx has been broken, more to follow? May be not. Berbatov’s first season was anything but a dream one. Nightmare is a closer guess. He struggled throughout the season getting over looked for crucial Champions League fixtures. The fans were close to the point of giving up, the price tag still loomed large over their heads. What an anti climax to a bright career. The returns for the money spent was stacked heavily against Berbatov. Cries for “sell him” have not gone away ever since then. There has not been a single transfer window where he hasn’t been linked away but that was never going to happen. Forgot the script? The following season saw the departure of Ronaldo and Tevez. The fans had their hopes pinned on him, hoping for him to come good. Wishful thinking. But Mitko, as he is affectionately known back in his home land, was clearly succumbing to the pressure of being one of his kind. The gaze into the pitch from the bench clearly showed how strongly he felt he deserves to be there. Yet when the chances came he fluffed them. The angry shrug of the shoulders on being denied a cleverly worked one-two clearly showed a man who was trying just too hard. Things went from bad to worse. The occasional slip infront of the goal, tricks going wrong or misses which would put Bendtner to shame. Time was running out. 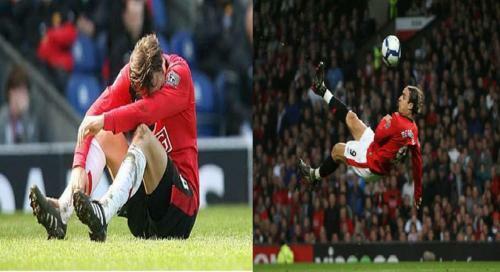 In the season 2010-2011, Dimitar Berbatov looked better. In fact he has never looked any better in a red shirt. Never too late they say. The fans were happy as United were being propelled towards their quest for 19th by the most unlikely agent, the 30.5 million rated Dimitar Berbatov. Goals galore,hat trick against bitter Merseyside rivals and followed up with a fiver against Blackburn. Dimitar Berbatov had ensured United get their 19th and he gets the Golden Boot. The smile was back, he was teeming with confidence. No more lazy strolls, no more mellow interviews and no more delaying the fairy tale any further. This was the moment. This Berbatov was anything like we have seen before, no drooping shoulders. He never had the heart of a winner, but surely had the talent of one. Now he seemed like a man who was more intent on enjoying the game and take chances as they come. The emergence of ‘Little Pea’ towards the later half of the season and his fancy for goal provided Sir Alex a very exciting strike partnership up front, in which sadly there was no Berbatov. The club’s leading goal scorer was overlooked for the crucial fixtures of UEFA Champions League semis, Chelsea fixture touted as the BPL finale and of course the Wembley final. Very few questioned the selection though, since Chicharito deserved every bit of it. But what few people noticed was that the Berbatov he displaced from the starting line up was not sulking on the bench, but ready to come on as and when required. He looked a completely different player, someone somewhere must have helped get his head in order and perhaps the heart too. As I write, he is all geared up for the pre season. Side by side, the tabloids keep reporting stories where he is supposedly going to be used as a bait to get someone to shore up our midfield crisis. But the only constant in his story,is you will always hear stories like them. The story is far from over though. He has had his share of criticism,even to the point of being called a traitor back home for quitting national duties. Time to win them back I guess. Or may be its just not in the script. May be it’s suppose to end this way,with him having fewer admirers who will stick around knowing there are not many as good as him. The question that begs us all, is this a genius gone wrong? Previous PostThe Ginger United of Paul ScholesNext PostOf JCT’s demise and the dominion of doom in Indian Football.